Resident Workshops are occasionally offered at the studio of Sandy Webster for up to three participants housed in a studio apartment at the Webster’s from Sunday evening to Friday morning. Room and board are included with tuition. Materials fee will be determined by students needs. Contact Sandy for further information. 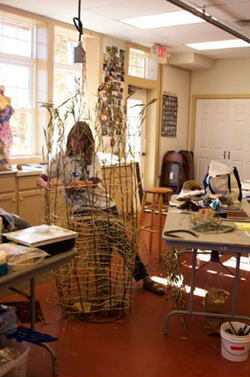 In addition to Resident Workshops, Sandy teaches workshops throughout the US and abroad. Her current schedule is as follows. 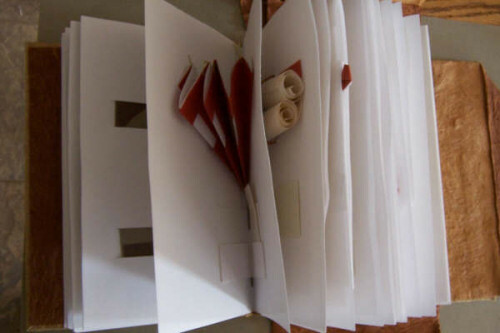 Students will be introduced to Japanese Stab Bindings, books with variations on the Accordion Fold, Hard Cover Blank Journals with Coptic Bindings as well as several Folded Constructions. 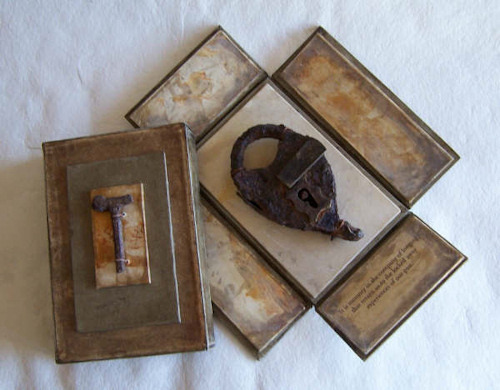 We will also look at works that show how the content or subject of the book can be built into the form. Students will design their own specific journals that will also incorporate all the necessary equipment to work with in the field. 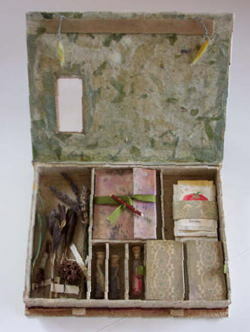 Papers, paints, pencils, pens, places for collected objects and eyeglasses …. whatever is needed can be accommodated in these highly individualized portfolios that travel from field to studio. This class is designed as an exploration of the path from idea to object. We will begin with visual definitions of specific words, which trigger ideas that resonate differently with each student. From there we will advance through a variety of processes that construct and enhance those concepts. The work can take on any form, which can reveal or conceal as much as the student wishes. The concentration of the class is to bring form to idea and is open to all levels. Suggestions for forms are book, altar piece, screen, box, basket … any form that addresses and contains the concept of each student individually. 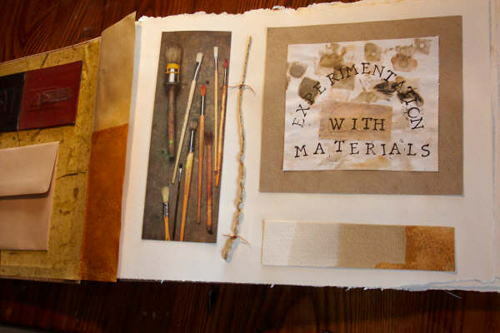 We will learn and put into practice various techniques such as grinding pigments from local clays, transferring imagery, chemically rusting papers and altering the surfaces of cloth and other materials while constructing unique and individualized forms that reveal and conceal space. Students will complete a comprehensive notebook of these techniques and the possible uses in their own work. This class will organize the collectibles of a specific time or place. First the size of the project is determined by the laying out of the pieces to be “saved”, then appropriate fabrics and papers are selected to create a book and design a box which will hold not only the book, but the souvenirs and a small basket. Basic bookbinding, box making, and basketry are the techniques used in creating a unique space for your collection. 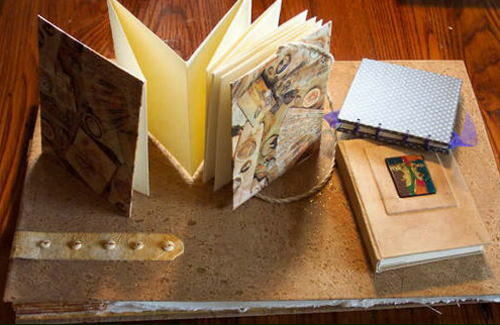 This workshop explores several constructions for creating hidden spaces in books. Students are encouraged to find ways to personalize the variations from stitching, creating pockets, learning pop-ups and manipulating pages while completing a sample book of techniques. Collections brought from home or acquired on site will be the inspiration for recording their importance and housing them in unique constructions. The objects will be used to make marks and illustrations for books and papers which are then written into and on as we journal the memories and value of each item. Finally a box will be made to house each student’s collection and the small books they inspired. Students can expect to explore the many ways to illustrate, create unique books and build various box forms that reveal and conceal space. We will take the time to reflect and write accompanying text for the personal and meaningful objects we simply can’t help but hold onto. 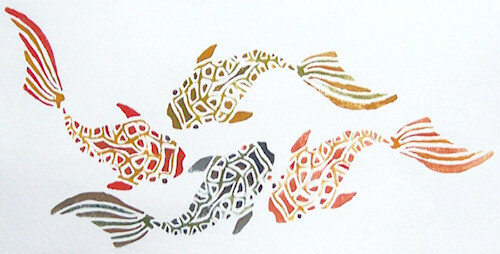 The process of white-line wood block prints is also known as Provincetown printmaking from its origins in early 1900’s New England when artists experimented with a simpler approach to making relief prints with many color options. 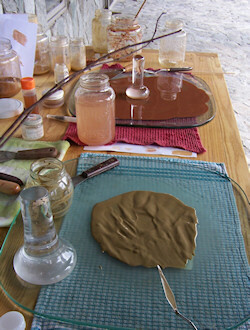 Students will learn how to make pigments from soils gathered on or near our location. Through hands-on demonstrations we will process our own unique paint using various methods of extracting the color. These will then be ground into beautiful paints to be used on paper and cloth using a selection of binding mediums.